Conker Statistics presented at the International Conference on Teaching Statistics in July 2010 at Ljubljana, Slovenia. Every four years statistical practitioners and academics get together to share their experiences and insights into the teaching of statistics throughout the world. On this occasion the theme was “Data and context in statistics education: Towards an evidence-based society”. Conker Statistics were invited to present their collaborative work with The University of Sheffield on the Statistics Poster Challenge for Schools (SPoC). The experiences of running the challenge, including setting up the website, promoting the challenge, setting rules, standard of entries, giving feedback and judging were presented. Plenary Sessions: The plenary sessions with international speakers were inspirational. 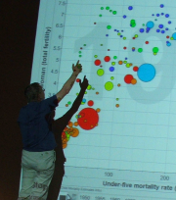 Hans Rosling, the genius behind the Gapminder tool which displays the world’s most important trends, gave a showbiz talk to illustrate the wealth and health of world nations over time. The inspiring talk titled “Helping Doctors and Patients Make Sense of Health Statistics” by Gerd Gigerenzer clearly illustrated the misunderstandings of patients and doctors and how the marketing campaigns of pharmaceutical have unwarranted enthusiasm for their drugs. He concluded that few doctors and patients understand health statistics and that collective statistical illiteracy is largely caused by lack of education in statistical thinking and lack of training in transparent risk communication. The suggested solution is to teach statistical thinking and risk communication in schools. Cliff Konold the mastermind behind the data analysis package TinkerPlots, an analysis tool for young students, gave a superb demonstration of the many colourful, interactive features. The premise that guided the initial TinkerPlots design was to allow young students to accomplish goals that make sense to them, using operations that they understood. Taking this further, Cliff demonstrated that more advanced data analysis and ideas can be introduced to novices by building on the understanding and skills learned from the basic tool. Neville Davies and John Marriott from the Royal Statistical Society Centre for Statistical Education based at the University of Plymouth. Helen MacGillivray, the president of the International Association for statistical Education (IASE) and inspiration for the AtSchool “Stretchiness” activity developed by Conker Statistics in 2009. Adrian Bowman from the University of Glasgow who gave an interesting talk on the use of rpanel package developed for the free statistical software system R.
Doreen Connor, the lady who ran the CensusAtSchool project in the UK and developed many data handling resources used in schools throughout the UK. Mark Crowley, the man behind the creative developments of ExperimentsAtScool and the CensusAtSchool data interrogation tool.